Yellowstone National Park has long been seen as a wondrous and magical place. The park is widely held to be the first national park in the world, and constitutes over 2 million acres of land across Wyoming, Montana and Idaho. In the early 19th century, a select group of US Army volunteers, dubbed the Lewis and Clark Expedition, were sent by President Thomas Jefferson to explore and map the mysterious West. Of this group was John Colter, who broke away from the group in 1806 and passed through a section of the park, the first recorded white explorer in the region. Colter brought back stories of ‘hot spring brimstone’ in the wilderness, dubbed ‘Colter’s Hell’, and other reports of boiling bubbling mud, colourful towering rocks, steaming rivers and petrified trees were dismissed as delirium and myth. The forests, mountains were wild and alive in ways few could imagine. These mysterious tales were restricted to fur-trapper tales around the campfire, until formal expeditions in the region brought Yellowstone to mass attention. It can be difficult to remember, in the context of modern London, that nature was perceived to be so active, all by itself. When you become used to the idea of boiling hot water hurling into the sky, or psychedelic colours pouring through streams, it is easy to forget that all of this occurs whether we, human beings, intervene or not. Images made at the hands of man simultaneously detach and connect us to these magical far off lands. We think we know the ocean depths and the Amazon rainforest, through super-technical nature documentaries, and high-definition photography, and yet humans are rarely a part of it. We enter luscious, alien worlds from the safety of our own homes. In the case of Yellowstone Park, droves of tourist buses ship herds of people through ‘Yellowstone’, where a selfie with Old Faithful is enough to constitute ‘knowing’ it. We consume nature, and yet, out there, it lives and is as much the material world as it is the natural world. Tim Ingold’s ‘Materials against materiality’ comes to mind when thinking about the national park, and the ways in which we represent and interact with it. He seeks to reclaim materials considering their histories as ever changing and processual, rather than the result of action upon them. Images of nature then, can be difficult to contemplate. They make still the alive, and only visually represents the world – crucial aspects of nature, the sulphuric smells, the speed and noise of water, the textures of the bark and the dirt, are all missing. But somehow, these images hold some kind of agency, stepping in for the memory of such experiences with nature. 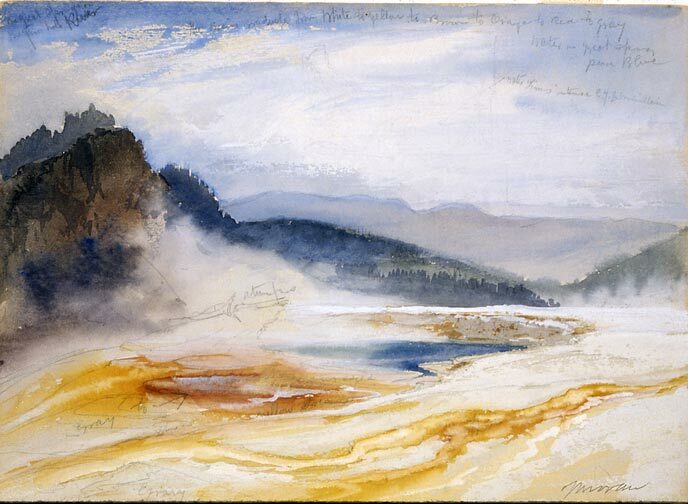 Moran’s paintings became a focal point for Congress in 1972, relied upon to express the magic of Yellowstone in order to protect it. This power cannot go unnoticed. On my own visit to Yellowstone in the autumn of 2016, the park did not fail to surprise, test, and even torment us. We drove by forest fires, alighting itself in the dry heat of the summer, and while the park had historically attempted to control it, their policy now is to let the park sustain itself in fire. We explored crumbling, charcoal forests, in awe of the way the forest sustains itself with these fires. I sketched with pieces of charcoal from the ground, wanting to remember the scorched smell and spikes of black piercing the sky. Other occasions of nature were just as surreal. In the two weeks I was there, the sun seared at 30 degrees, followed by a week-long snow storm. Buffalo became swaying, dark masses in the white, and Old Faithful became lost in the grey sky. Overnight, the park was glorious greens and yellows to a sea of white. Somehow, making images of these changes could capture, at least for own sake, these almost other-worldly spaces and experiences. Starting with landscape, does this include the sky? Where do we put the sun, the moon and the stars? We can reach for the stars, but cannot touch them; are they, then, material realities with which humans can make contact, or do they exist for us only in the mind? Is the moon part of the material world for terrestrial travellers, or only for cosmonauts who touch down on the lunar landscape? How about sunlight? Life depends on it. But if sunlight were a constituent of the material world, then we would have to admit not only that the diurnal landscape differs materially from the nocturnal one, but also that the shadow of a landscape feature, such as a rock or tree, is as much a part of the material world as the feature itself. For creatures that live in the shade, it does indeed make a difference. What, then, of the air? When you breathe, or feel the wind on your face, are you engaging with the material world? When the fog descends, and everything around you looks dim and mysterious, has the material world changed, or are you just seeing the same world differently? Does rain belong to the material world, or only the puddles that it leaves in ditches and potholes? Does falling snow join the material world only once it settles on the ground? As engineers and builders know all too well, rain and frost can break up roads and buildings. How then can we claim that roads and buildings are part of the material world, if rain and frost are not? not to mention liquids of all kinds from ink to volcanic lava?